First there was Red Tiger, then came Blossom and Kamehameha. Slowly but surely the guys behind these three edgy and very distinct eateries have infused the Gay Village with some much need hip. For their fourth venture they not only left the gays behind, they also left the island of Montreal completely and set up shop in a mall in Brossard. 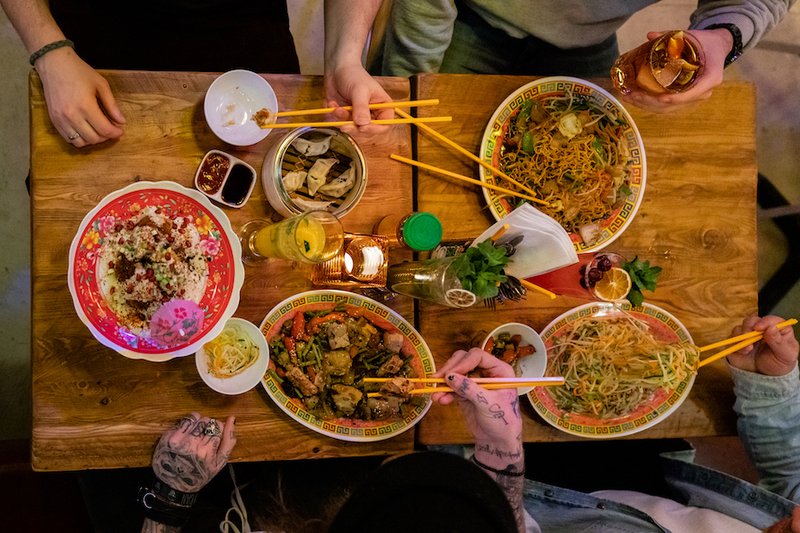 The Golden Dragon, a laidback Chinese restaurant with a striped-down 80’s vibe, wants to give the cool kids of Brossard their very own place to sit, chill and eat pretty great Chinese food. From an excellent cocktail menu to a concise yet well thought out list of a variety of different foods, the Golden Dragon may appear like it doesn’t want to take itself too seriously due to the eclectic decor but in the kitchen, business is serious. 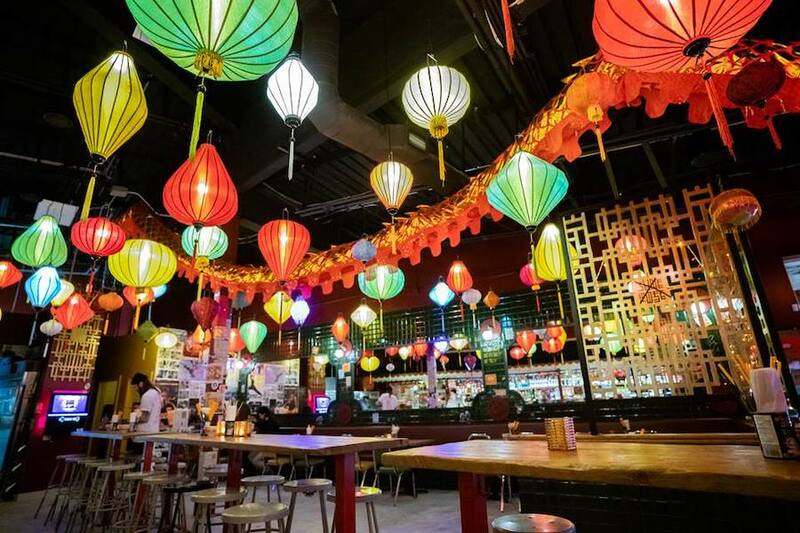 They’ve created a diverse little menu featuring dishes that at first glance look like your typical Chinese fare but as you look a little closer, you begin to see the remix. The Samantha “tao” Fox takes General Tao to a whole new level by making it with frogs legs, katsuobushi, red peppers and steamed rice. Their poutine (because we are in Quebec) yakuza drops the gravy and adds kimchi which ended up being one the dishes I liked the most all evening. We tried an assortment of different things including a dish called Mexico vs Hong Kong. Here they blend cocktail shrimp with nori ketchup, Vietnamese coriander, picked red onions and shrimp chips. We also tried some yoga chaud, another standout dish featuring fried eggplant, Shanghai onions, pickled shiitake, garlic scapes and rice. The restaurant has a lot to offer and I like their ballsy approach to creating new and interesting food. If you’re really brave, you might want to order the French kiss. This dish is an entire salmon head on a plate, cooked to perfection with a blend of ginger and turmeric coconut milk and comes out of kitchen with sparklers galore. It’s not for the faint of heart and I didn’t actually try it myself. My friends devoured it and ranted about how I should definitely pick some of the delectable meat out of the fish’s skull. Maybe next time. If you happen to be in the area, you should stop in give the Golden Dragon a try for lunch or dinner. 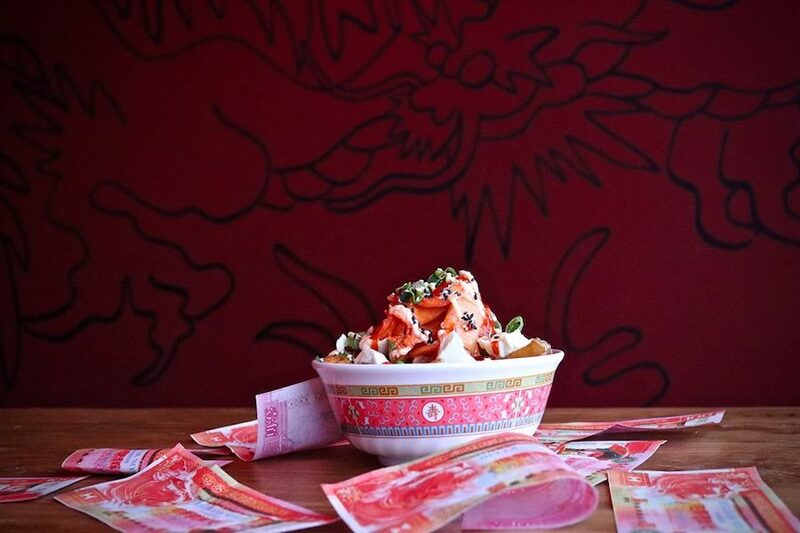 They’re attached to a pretty cool market which is fun and who knows, their take on Chinese food might even get Montrealer’s to admit that cool things can happen off island. You can check out their entire menu here.